Lee and Nicole's wedding starting at the Celebration Church in downtown Appleton, WI and ending with a reception at Waverly Beach earlier in 2016 was one to remember. My pal Leah and I collaborated for this one (as usual! ), as Leah has known the couple for quite some time through a community that connects people passionate about Jesus called CRU. I've come to know a few CRU weddings through shooting and attending events over the last couple of years, and let me just say they are always a blast! Every last person likes to dance, the sense of community is overwhelmingly strong, and the brides + grooms are always so welcoming and kind to us as photographers. Win-win! The day started out at Nicole's house with her bridesmaids, personal attendants, and her family all gathered together to help each other paint nails, share makeup, and gush about each other's lives. Nicole's gift to each of the girls was a gold bracelet and each one was a little bit different, but all so elegant! Mimosas were handed out, sandwiches were made, and music was always playing. All the girls got into their long, classy black bridesmaids dresses, highlighted with their new gold bracelets to match. 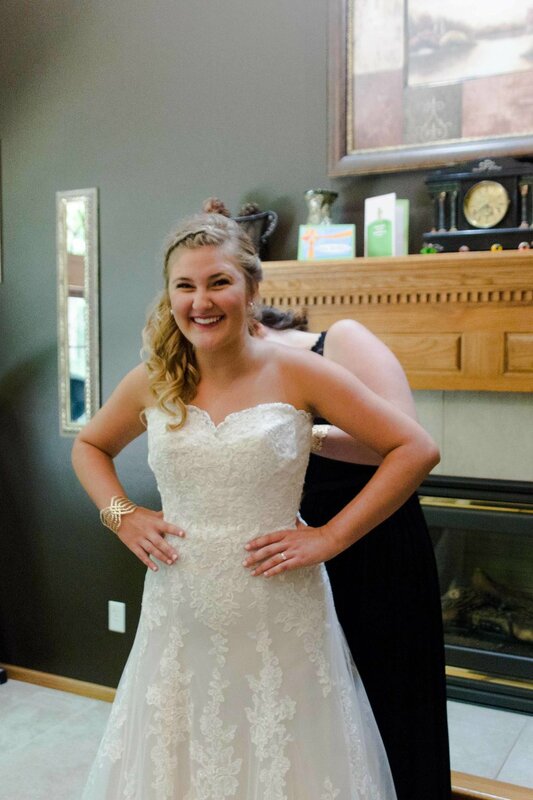 Once Nicole started to put on her dress and accessories, everybody gathered in the living room to help, take candid photos, and let out squeals of excitement. It was only an hour until the ceremony at this point, so everybody headed to the church to get settled in and wait for everything to begin. Lee's friends surrounded him from the moment he arrived at the church (I'm sure all morning, too! ), and we met in the balcony of the church to stay as far away from Nicole as possible. I could see Lee fidgeting and checking the clock every few minutes and could tell he was so excited to see his bride. His guys gathered around him and each took a moment to pray over their marriage, their future, and anything that may be thrown their way. Lee knew he was ready for this! I headed back down to see the girls in the basement only to find them taking tons of selfies and playing music to keep Nicole's nerves calm. Everybody was full of smiles the entire morning and their energy was contagious! The girls came in close with Nicole and wrapped their arms around each others waists to pray over her before she marries her best friend. It only took a few moments for Nicole to tear up and pull out her emergency tissues, but the kindest words were spoken and everyone got teary eyed (including me, ha!). We were almost ready for the ceremony to begin, so we headed upstairs and everyone got into their places. Once the ceremony began, the Pastor had so many thoughtful and kind words to say to Lee and Nicole followed by one of the groomsmen leading us in worship with his acoustic guitar. It was a beautiful service ended with a sweet kiss between the newly married couple. Everybody cheered as the couple headed out to the lobby and shared tons of hugs and words of encouragement. While the family and friends headed to the reception for cocktail hour, Leah and I took the wedding party to a few different locations around the church neighborhood and near the Fox River for group photos, and then ran off with just Lee and Nicole for some one on one portraits of them. We had a blast shooting around the area and decided the reception was our next stop- party time! Waverly Beach has a huge reception hall right on Lake Winnebago, so guests were everywhere enjoying the lakefront, the bar, and the fun photobooth set up inside. Once everyone had eaten and toasts were made, everybody was more than excited to start dancing! Lee and Nicole shared a few dances with their parents, and as soon as the opened up the dance floor to the rest of the guests, it was definitely about to get wild. The dance floor was flooded and even Leah and I grooved along with a few songs. What a blast of a reception! Lee and Nicole's wedding was full of joy, laughter, long hugs, and loads of love. Wishing them both a wonderful marriage and fulfilling life with friends and family.